A colourful custom signet ring for Fran. Fran came to me after seeing my Bedrock rings- she loved the hand carved geometric forms with gemstones embedded on the front and sides. She wanted me to create a chunky version, with a big white diamond in the center and a sprinkle of gems on the side. Being a painter, she chose a beautiful palette of colours in sapphires and diamonds. I absolutely love how this ring turned out… a truly collaborative piece between me & a client which turned out just as she imagined. A custom engagement ring for my lovely clients Michael & Michelle- Australian Champagne Diamond & 18ct Yellow Gold. Michael proposed to Michelle with the loose diamond over the Christmas holidays, and then they both chose the setting and design together with me at my studio. We went for my signature hand carved textured solitaire, customised with a slightly wider border and ring band to balance the size of the diamond. 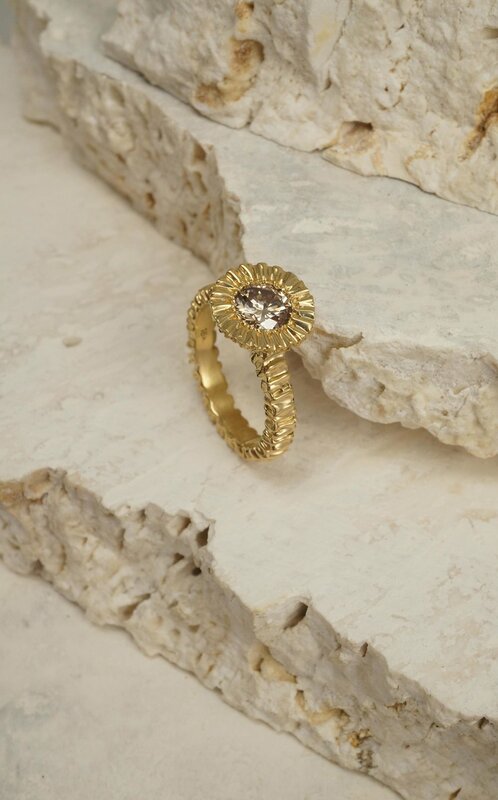 They decided to cast it in rich 18ct yellow gold, to complement the warm tones of the diamond. See this beauty sparkle in motion over on my Instagram. A custom engagement ring from earlier in the year. One of the things I enjoy most about custom pieces is when I get challenged to try new things, they often end up sparking new ideas I might have not come across otherwise. Anna bought this beautiful Asscher cut Sri Lankan Alexandrite to me, to creature a unique engagement + wedding ring set. This gemstone cut was one I hadn’t worked with before so was excited to create something different, but still stay true to my style. 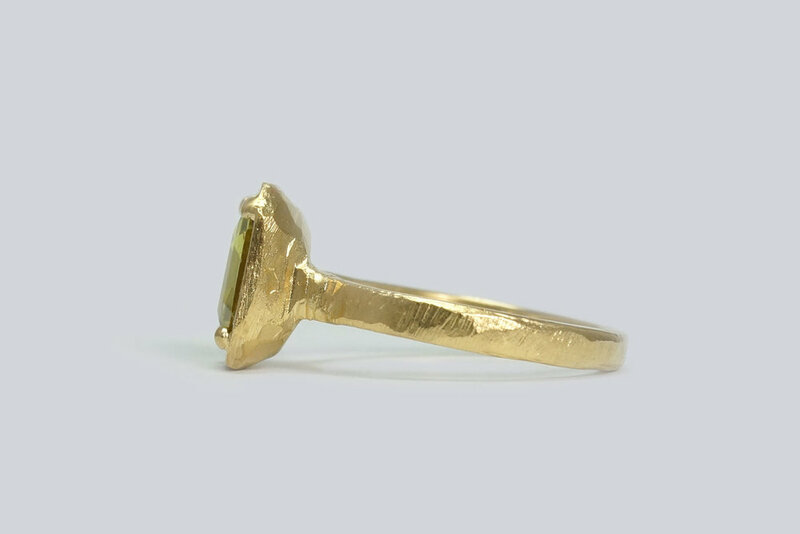 We set it into a hand carved 18ct gold setting, paired with an 18ct gold teeth wedder for some contrast in texture. I am happy to incorporate your own gemstones or diamonds into custom pieces. Get in touch with me here to find out more about the process. As most of my jewels are handmade to order & the studio will be closed for a couple weeks over the holidays, make sure you place your orders by these dates to ensure your item will be delivered before Christmas. Please note: delivery before Christmas can only be guaranteed if express shipping is selected at checkout. Custom Jewellery orders have now closed for 2018, but get in touch here to book a project in for the New Year. The studio will be closed between December 20th - January 7th 2019- therefore all orders placed after December 16th 2018 will be processed January 7th 2019. If your item is a Christmas gift, exchanges will be accepted up to January 14th 2019. Buying a gift and unsure of the ring size? All rings may be resized free after Christmas if the item is a gift and you are unsure of the ring size. Just leave a note in the checkout with your purchase and I will include a free ring sizer with your purchase. Shipping to & from the studio for resizing is the responsibility of the customer. All rings will be resized free of charge with the exception of 9ct or 18ct gold rings which need to be resized larger than 1 size. Please don’t hesitate to contact me to see what items I have in stock ready to ship, or if you have any questions about production & delivery times. Thank you & happy holidays! Join me in store at Miss Crabb for a two day special event of gems + jewels! As well as having a selection of new one off pieces available, I will have a selection of gemstones & and gemless rings available, so you can have a play with different metal and gemstone combinations & customise your own ring. Your custom piece will then be made to your size & specifications, gift wrapped and delivered back to Miss Crabb in time for Christmas. Complementary bubbles upon arrival. If you would like to book an appointment while I am in Auckland for a future custom piece, please email me here to make a time. Peach Sapphire & Argyle Diamond Engagement ring. A surprise engagement ring for my long time friend Kyra. Her boyfriend Josh got in touch and gave me a bit of freedom to come up with a few different ideas of what she might like. Kyra was a florist so wanted to make something with soft colour, she had also once mentioned Morganites & Diamonds in a comment which I used as my starting point. I mocked up a few photoshopped images of my ideas and sent them to Josh. He liked the round central gem flanked by two diamonds, so I began the hunt for the perfect gem. Photoshopped concepts of possible engagement rings. Morganites are beautiful peachy-pink gemstone but they are a bit softer than a sapphire or diamond, which are the gemstones I most recommend for engagement rings because of the extra durability. Luckily sapphires come in just about every colour under the sun, so I managed to source a beautiful peachy pink Morganite-coloured sapphire just for her. Nestled between two white Australian Argyle and cast in 18ct rose gold- the most beautiful and rich colour of rose gold. I had originally thought to put champagne diamonds on the side, but once the ring was cast in the 18ct rose gold, we decided to go for classic white diamonds for contrast and so the peach tones in the sapphire would stand out. Click here to see a video of this beautiful peachy pink sapphire in motion. A custom engagement ring commissioned earlier in the year for a couple in New Zealand. Gray had a brief idea of what he wanted, referencing my Cirus Ring for the molten & beaten characteristics. I did a few initial sketches, and he decided on five dark blue Australian Sapphires tapered from the centre for some symmetry & balance. 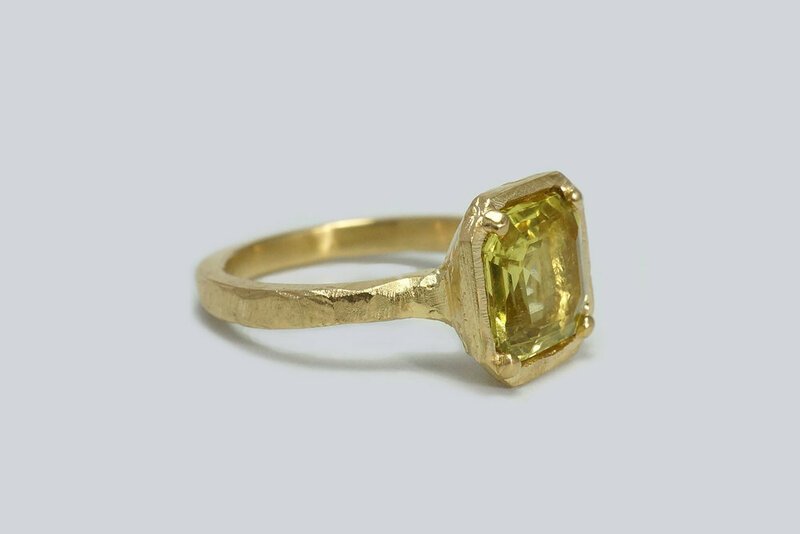 I carved up a ring in green carving wax with the stones temporarily in place, & emailed Gray lots of pictures to make sure it was exactly what he had imagined, before casting it in 14ct yellow gold. Natalie came by my studio last year when she was visiting Sydney, wanting me to remodel some of her rings. She loved another ring I had in the studio at the time which I was working on for another client- a rough carved signet style ring in gold which had smooth face + a single diamond embedded on the front. She also liked shape of this signet ring I made a while back, so we took elements of both & refined it slightly to bring the gold weight down. I photoshopped a few different gemstone placement options on the ring so she could visualise the final piece, deciding on 8x champagne diamonds randomly scattered over the front. The majority of the custom pieces I make are rings, so making an earring + pendant set was a refreshing & fun project to work on. These pieces are a similar design to my Dita Studs, and Dita Necklace, but with a larger central gemstone. 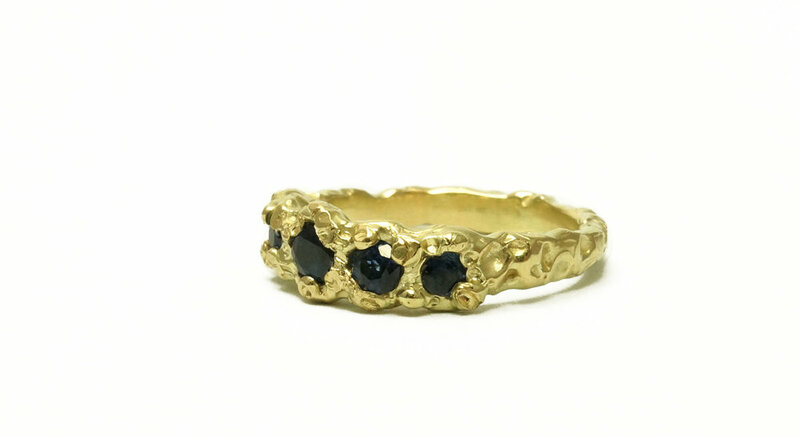 I sourced some beautiful teal Australian sapphires which change between blue-green depending on the light, & cast the hand carved setting in rich 18 carat yellow gold to complement & enhance the colour of the sapphires. These designs can be custom made in any colour combination of the metal and gemstone rainbow. Think rose gold with rubies... white gold with white diamonds... or yellow gold with emeralds... any & all possibilities. I created a few different wax carvings all slightly different sizes, some with more & some with less texture. We found the perfect balance in the final one, which was then cast in 14ct Rose Gold, & set with varying shades of blue Australian Sapphires. Engagement rings don't have to be the biggest white diamond solitaire. I love creating pieces which are more thoughtful, unique and personal to the wearer. To talk about making your own custom piece, get in touch with me here or book an appointment at my Sydney based studio. A custom engagement ring I recently completed for Paddy. Read below to learn more about the process of creating this particular custom piece, & how he proposed to his girlfriend Claudia while on holiday in Italy. Paddy got in touch via email about a custom engagement ring for his girlfriend Claudia. He had a good idea of what he wanted: he loved the Golden Teeth Solitaire style & knew he wanted to use a large central sapphire, but was open to me coming up with a few different ideas to create something entirely unique for him. Instead of hand drawing some concepts up on paper, I mocked up some rough photoshopped images of different sapphires and stone placement. This allowed me to be a bit more playful with ideas and also helped to give Paddy a more realistic example of the finished piece. Paddy was drawn to the symmetrical design of the round central sapphire flanked by two Australian diamonds, as it combined traditional & contemporary elements. I mocked up a few more photoshopped ring concepts, this time with sapphires I had available to me and with quotes attached. Rough photoshopped concepts for my client exploring gem placement, shape & colour. Paddy chose a beautiful 0.96ct Blue Australian Sapphire sourced from Queensland & cut in South Australia. The ring was hand carved & cast in 18ct white gold, the sapphire set & flanked with two ethically sourced white Australian Argyle diamonds. Paddy shared his proposal story and a few words on his experience working with me to create his custom piece. "We have both been pretty busy with work and haven’t had much time off together for the last year or so. We had a two week holiday to Europe booked and it occurred to me that it would be a good time to pop the question. I’d made my mind up a while ago that I wanted to marry Claudia. But I wanted it to be at least a little bit romantic. So with the ring stuffed away in my hand luggage we jetted off to Rome. On our first night I took Claud’s on a little walking sojourn. We saw a few sites along the way and ended up on top of one of the 7 hills of Rome over looking the setting sun. I fumbled around for the ring and dropped a knee. She was very surprised and thought I was joking for a little bit. Anyway she said yes and pop went the champagne. Claud’s was wearing another ring on that finger at the time, and because of the recent long haul flight was overloaded with fluid. We almost ripped her finger off to get the ring off and then slid the new one onto the red sausage like finger. Having such a beautiful ring made the whole experience that much better. We both love the final product and its special to have been apart of the process from inception to finger. Allie was amazing to work with from start to finish. Professional yet personal. 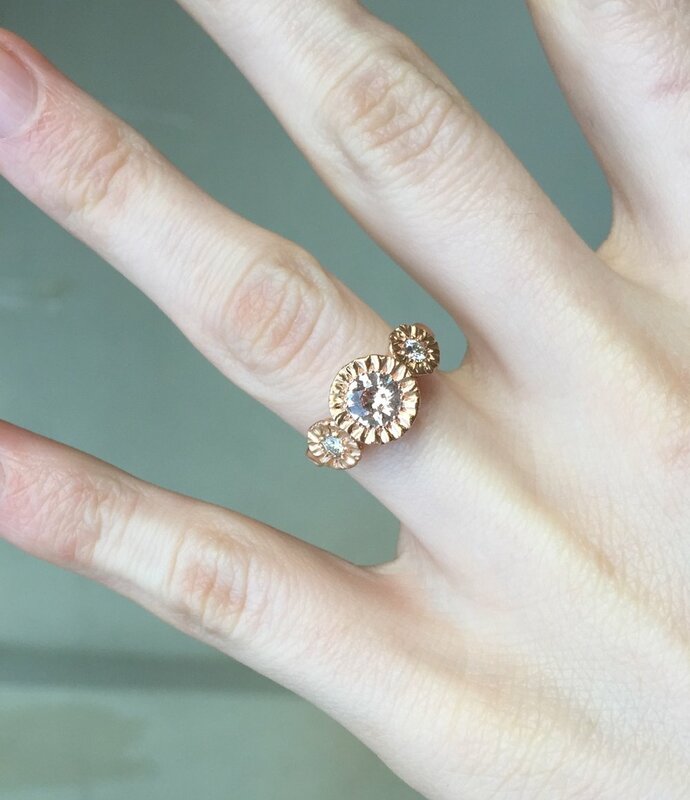 She guided me through the design process and the ring ended up being the dream ring." A big thank you & congratulations to Paddy + Claudia. To enquire about a custom piece of your own, please get in touch with here. Australian Sapphires would have to be one of my favourite gemstones to work with, they come in the most beautiful array of colours: blue, green, yellow and beyond. 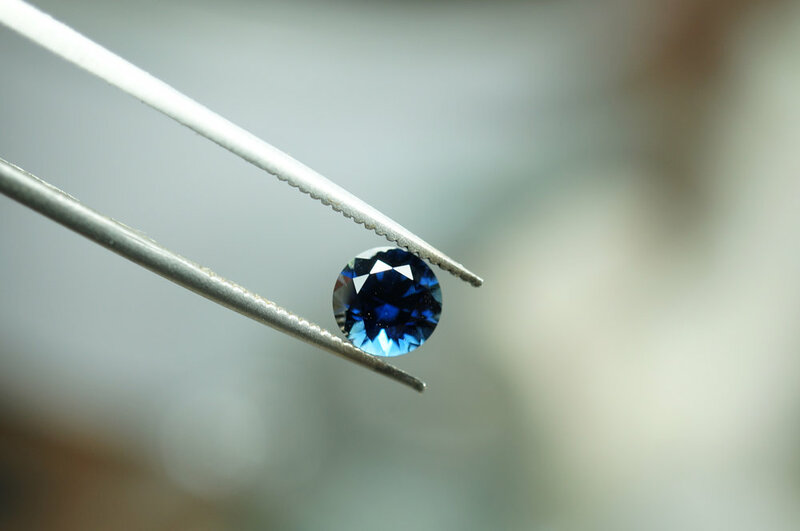 I am particularly drawn to the Australian Parti Sapphire which can have multiple colours present in one stone. In different light and with movement, the colours change between blue, green & yellow making each piece entirely unique. Sapphires are second in hardness to a diamond, so they make a great choice for an engagement ring as they can withstand everyday wear & are less prone to chips and scratches. The Australian sapphires I use in my bespoke pieces are sourced and cut here in Australia, so if an ethically sourced gemstone or supporting small local businesses is of importance to you, then Australian Sapphires are a perfect choice. 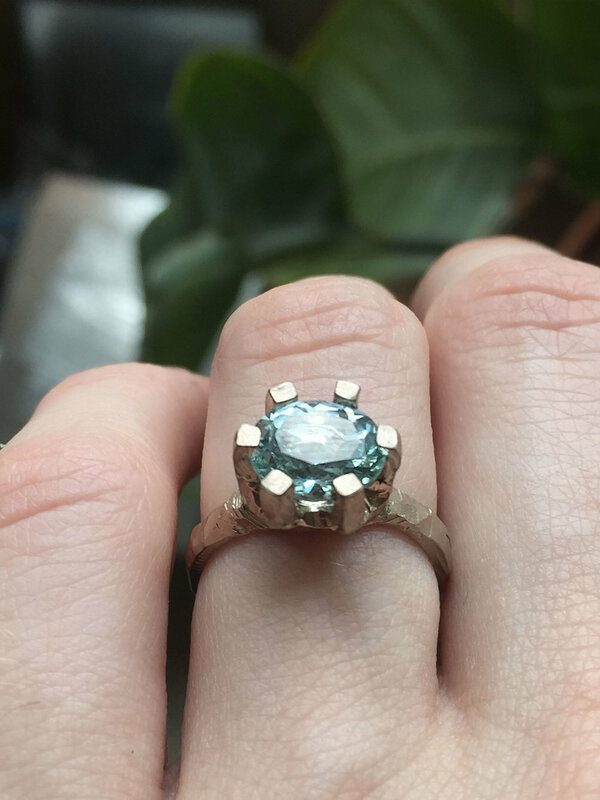 Below is a recent custom engagement ring, featuring a beautiful Australian Sapphire which changes from dark blue to bright blue with flashes of teal green. Claire was proposed to with a simple gold band with the intention of her being able to choose an engagement ring she loves. I met with Claire in Auckland so she could try on some rings, she was drawn to my Golden Teeth Solitaire with an Australian Parti Sapphire. Back in my Sydney studio I contacted my supplier and found a few different sapphire options for Claire to choose from. She decided on the most beautiful teal blue Australian Sapphire. 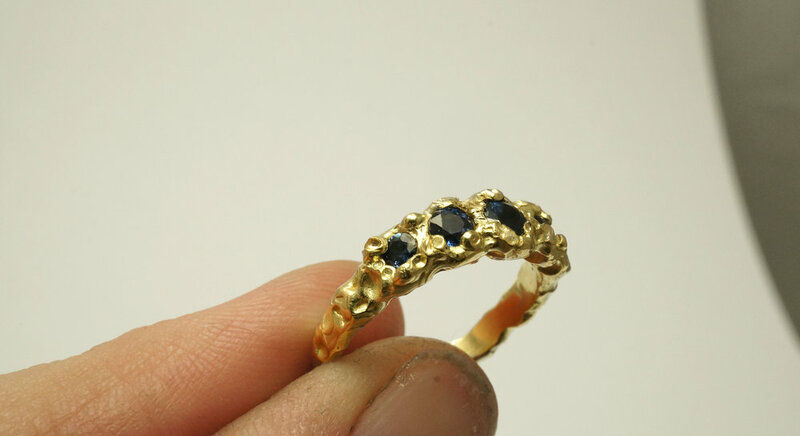 Once the sapphire arrived in the studio, I started hand carving up the ring in wax. 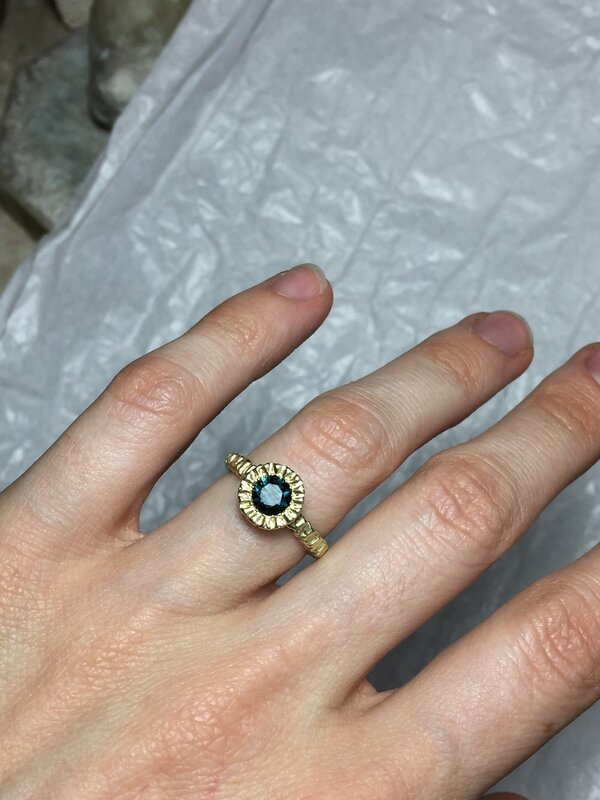 I sent photos & videos to Claire of the wax on my hand and with the sapphire in place, to make sure it was exactly what she had envisioned before casting it in the chosen metal.The wax was then cast in rich yellow gold & the sapphire set securely with subtle beads disguised within the molten hand carved texture. I can source all shapes, colours and sizes of Australian Sapphires, and can even have them custom cut to your specifications. To see what pieces I currently have available for bespoke commissions, or to book a custom piece consultation in Sydney or Auckland (next Auckland appointments available in June 2018), please get in touch. A custom engagement ring featuring a rough hand carved claw setting cast in 18ct White Gold, and a beautiful oval 1.76ct teal blue Aquamarine. This was made for a client very sadly lost her engagement ring. She wanted to keep elements of the original ring which was a more traditional claw setting, featuring a blue topaz in white gold. I found this beautiful translucent Aquamarine & set it in white gold to keep icy tones of the original ring, and transformed the traditional claw setting into something a bit more contemporary. A recent commission. Sue has owned these diamonds for a while and had been waiting to find the right designer to make her something with them. 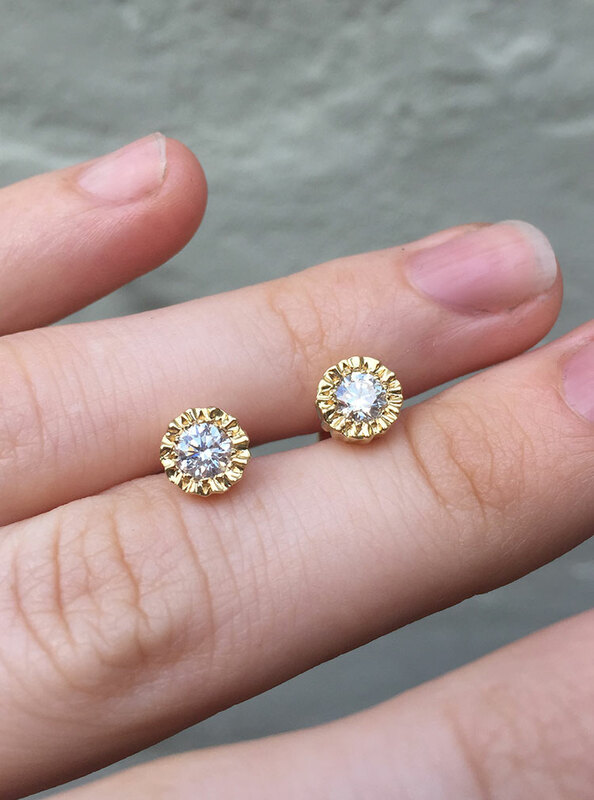 We went with rich 18 carat yellow gold in my signature molten textured setting, and attached screw back posts to make them extra secure. So happy with how these ones turned out and oh do they sparkle! 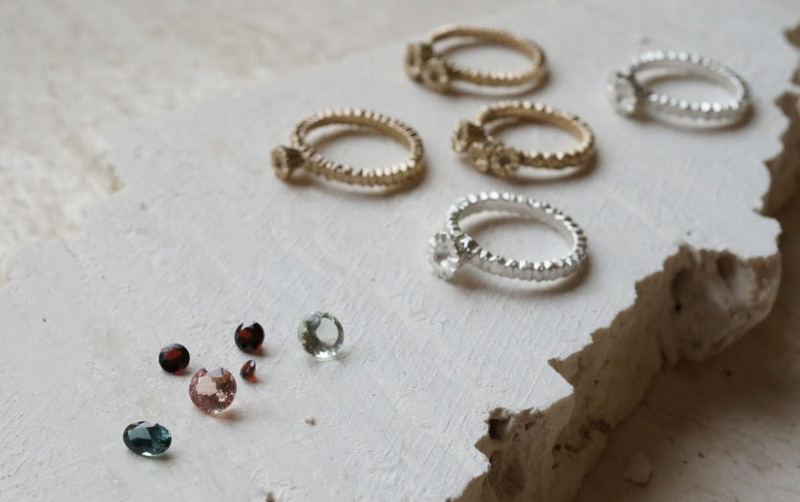 I'm happy to incorporate your own vintage or heirloom gems or diamonds into a custom piece, if you would like to inquire about having some unique jewellery made just for you, get in touch here to start the conversation. I feel so lucky to have the opportunity to regularly work on personal commissions for my clients, and to create precious pieces that represent such important moments in their lives. Read below to learn more about the process of a recent commission, a bespoke engagement ring commissioned by Matt for his girlfriend Ellen. Bespoke Engagement Ring. 18ct White Palladium gold with Blue Australian Sapphires. Matt got in touch via email inquiring about having a custom engagement ring made for his girlfriend Ellen. He included a few reference images of other pieces of my jewellery he liked- this past custom bespoke engagement ring, and our signature Atlas wedding ring, as well as a short description to describe her favourite things. He wanted something unique and irregular, with several gems rather than one central stone in a classic solitaire design. 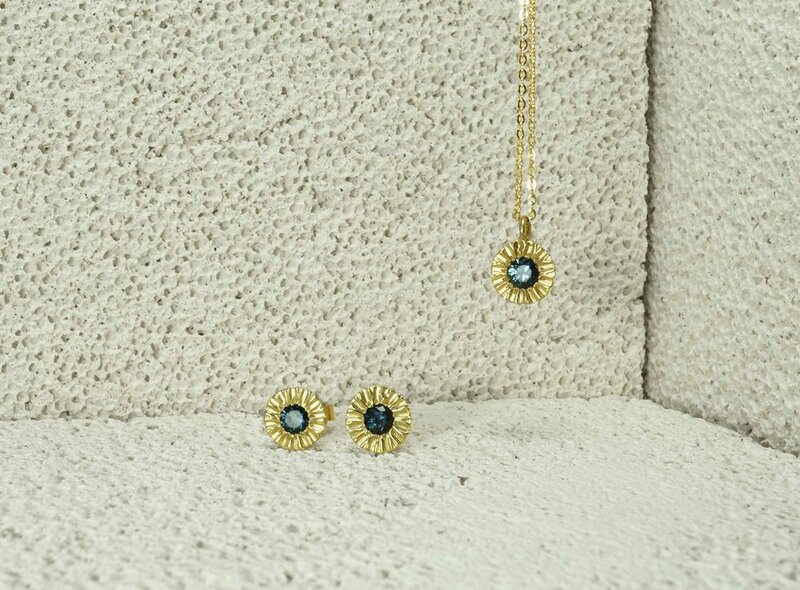 He liked the idea of blue sapphires or black diamonds set into a white metal. After a bit of forward and back discussion via email, I drew up a few quick sketches for him to check I was heading in the right direction, and he picked out his favourites. As Matt was based in Auckland, he was unable to come by my Sydney studio, so each step was thoroughly documented so he could feel involved in every part of the process. After the chosen wax model was finished and refined, I then cast it into the chosen metal- 18ct white palladium gold, a high quality alloy which is a beautiful gunmetal colour. Matt was still a little unsure about which gemstones or diamonds to use in the final piece, so I photographed the cast ring and photoshopped a few different options in place, so he could better visualise the finished piece. Australian sapphires were the final choice and were embedded into the white gold in my signature rough textured bead setting. The ring was packaged up in a hand made leather pouch and personally delivered to Matt in Auckland. Matt was kind enough to share his proposal story. "I had the ring in my pocket all evening, but no real plan of how I was going to give it to Ellen. Allie had just dropped the ring off to me that day, and I hadn't properly thought of some big flashy romantic way to propose - I just wanted to do it. I remember having my hand in my pocket on the couch, making sure it wasn't going to fall out. Looking back it must have looked pretty suss - the me clutching my pocket for hours while we were watching TV and having dinner. Matt: "The fancy ones, not the supermarket brand ones." Matt: "You have them in a mug, not a bowl." Matt: "Only fill the mug 3/4, not fully." Matt: "A teaspoon, not a tablespoon." I went into the kitchen and figured, if anything, that's the perfect time to ask someone to spend their life with you. It probably comes off as homebody-esque and cliche, but finishing sentences and knowing exactly what someone wants at any point in time while watching one of your favourite shows together... that's pretty much what couples do. It's not a cinematic romance, but it's real and that's what was important to me. So I came back with my hands behind my back and said pick a hand. She picked one, and it had the fancy frozen raspberries filled 3/4 up with. I said "Pick the other hand", which she did, and I got down on one knee and said "Do you wanna get married?". There weren't candles, there wasn't a song, there wasn't a grand gesture. It was us being us, with a beautiful ring which was perfect. Looking back I think the ring is like that story. I didn't know what I wanted it to look like, but I knew I'd know it when I saw it. And Allie was such an integral part of that. I wanted it to look vintage, but be brand new. I wanted personality in it, not clean cut. And it's honestly perfect. It's ours, and no one else has it". If you’d like to talk about a having a bespoke piece of jewellery made, get in touch here.